Sahara desert is among the world’s most expansive deserts and is located in northern Africa. Between the Mediterranean to the north and the red sea to the east, a huge chunk of the area has been swallowed by the Sahara desert. One interesting thing is that Sahara is an Arabic word that means a ‘desert’. There are lots of misconceptions about Sahara desert that needs to be clarified to so many people. Here is all you need to know about the arid land. History suggests that the emergence of the Sahara took place 7 million years ago and affected the plants and animals in the region—and possibly the early ancestors of human beings. Before the great desert was born, it was a fertile farmland with a reasonable population and at around 6000 BC, millet and grains were grown in most parts of the desert. In some parts of Sahara, prehistoric paintings have been discovered which shows that green flora was thriving in the area. 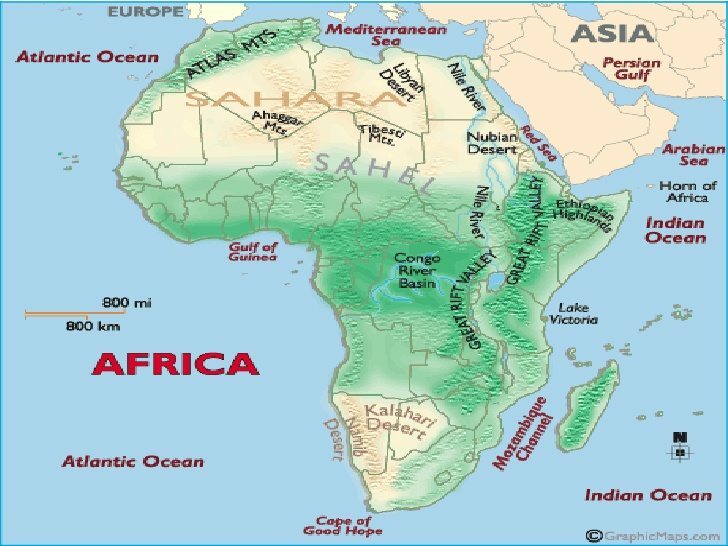 According to a study published in Nature, what set off the aridification in Africa was the replacement of the western arm of the Tethys Sea with the Arabian Peninsula around 7 to 11 million years ago. Replacing water with land, which reflects less sunlight, altered the region’s precipitation patterns. This created the Sahara and heightened its sensitivity to changes in Earth’s tilt. From the map above, the Sahara fill nearly all of northern Africa, measuring approximately 3,000 miles (4,800 km) from east to west and between 800 and 1,200 miles from north to south with a total area of some 3,320,000 square miles (8,600,000 square km); although the actual area varies as the desert expands and contracts over time. The desert is bordered in the west by the Atlantic Ocean, in the north by the Atlas Mountains and the Mediterranean Sea, in the east by the Red Sea, and in the south by the Sahel. 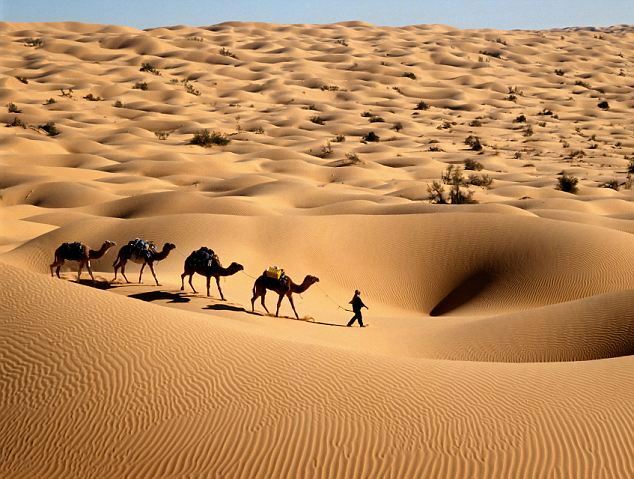 Like most people think, the Sahara is not always oven hot, though it is the largest hot desert and the third largest desert in the world after Antarctica and the Arctic. But between December and February, temperatures plunge due to lack of humidity. Some sand dunes in the Sahara desert may even be covered with snow! But there is no skating. However, Sahara is in history for generating the highest temperature in the world of 136 degrees in 1993. The climatic condition varies from one location to the other; subtropical climate is experienced in the northern part, while the south has a complete tropical climate. But over the years, the desert has undergone tremendous changes. Sahara has a small population of about 4 million people, regardless of the fact that it spread across eleven countries. Also, the area covered by Sahara is 8% the total surface area covered by the world. 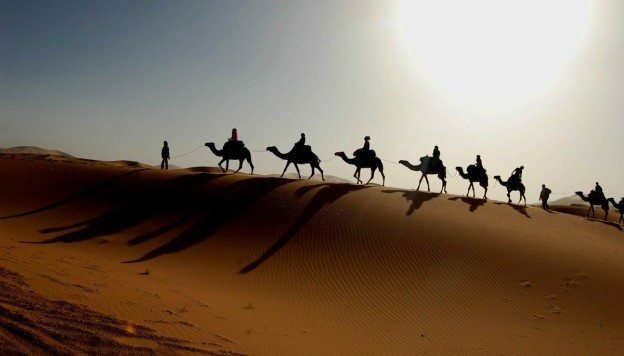 The desert is spread across eleven countries including Libya, Egypt, Algeria, Tunisia, Morocco, Chad, Niger, Eritrea, Mauritania, Sudan and Mali. Surprisingly the Sahara desert is home to more than a thousand tree species contrary to what comes to minds Sahara is mentioned. But very few of these plant species are found in the driest parts of the area. There are several oases (springs, wells) that are available in many parts of the Sahara which locals use for irrigation. About 80,000 square miles are available in the entire Sahara. There are several spots that are pretty fertile and productive, thanks to irrigation. In Egypt, places that border the Sahara desert have been transformed into green havens. 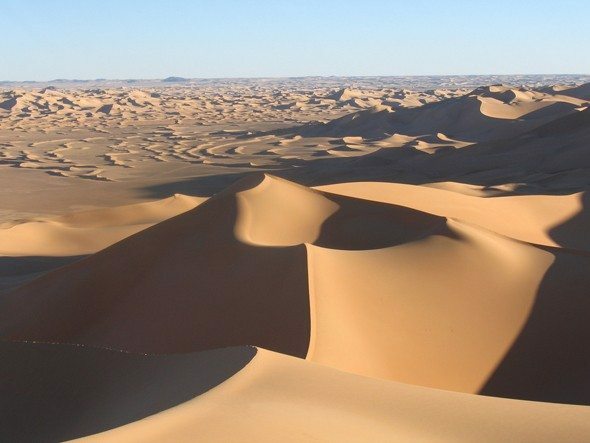 Although quite a huge chunk of the desert is composed of sand, the truth is that the amount of sand there is less than 50 percent. But in most of the places, sand just comprise the thin outer layer of the soil surface because it’s mainly carried away by the whirlwinds which are mostly seen there. As a matter of fact, the composition is 30% sand and 70% gravel/solid grounds. Animals living in the Sahara desert include the Saharan Silver Ant, Deathstalker Scorpion, Sand Viper, Desert Crocodile, Monitor Lizards, Black-Faced Firefinch, African Silverbill, Red-necked Ostrich, etc. Dung beetles are a common occurrence, however, unlike those that are attracted by the smell of dung and make rolls of any cow dung they come across, the Sahara beetles are said to lack the sense of smell. Most people don’t imagine running a marathon in a desert, but the truth is that a marathon by the name Marathon Des Sables is run in the southern parts of Morocco every year. It’s a race for the most courageous as well as for the masochistic. This race is run on several stages and runners are supposed to carry all the supplies that they need for the race.
. The Sahara desert is not always hot.
. Sahara is not the world’s biggest desert!
. It used to be a very fertile farmland.
. The arid land used to be a very fertile farmland.
. Even now, some parts of Sahara desert are very fertile.
. There are many occasions when snow falls in the Sahara desert.
. Sahara desert is home to many tree species.
. Only 30% of its soil is sandy.
. Dung beetles are a common occurrence.
. The Sahara is home to the toughest marathon ever!